So you're pining for Google Buzz, the social-feed addition to Gmail, but you're tired of hitting F5 every 30 seconds to see if it's on your Gmail. Here's how you can try out Google Buzz, get a head start on all your similarly Buzz-less buddies, and, of course, take one more step to Internet infamy by beating the Twitter mob to the punch. Google Buzz in the iPhone browser. Just because you don't have the Buzz tab added to your Gmail account yet doesn't mean you can't take Buzz for a spin with your smartphone. In most cases, you should be able to simply open up the Google Buzz homepage in your mobile browser and start spamming your buddies with geolocated Buzzes. 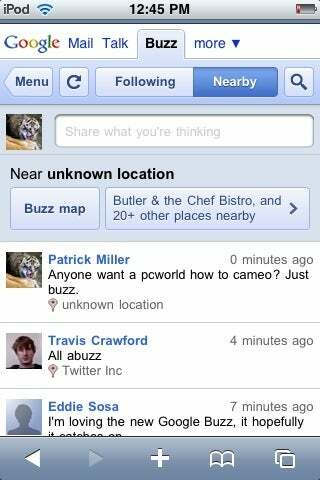 Some users have reported difficulty with the Buzz Web app but had no problem Buzzing from the Google Maps mobile Web app. I had no difficulty accessing Google Buzz through the iPod Touch's mobile Safari browser, but it didn't work quite so well for a handful of people using Android phones here at the PCWorld offices. Google Maps Buzz layer in the iPhone browser. Since most people don't have full Google Buzz functionality yet, your stream is going to be limited mostly to text comments; the Web app doesn't seem to include support for attaching phone-camera pictures, for example, though YouTube links are embedded just fine. 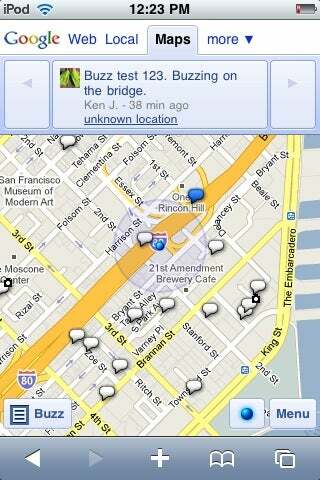 The geolocation features and the Google Maps layer are working, so you can see who else is Buzzing around you. You can also start building your Followers list by going through your Contacts. 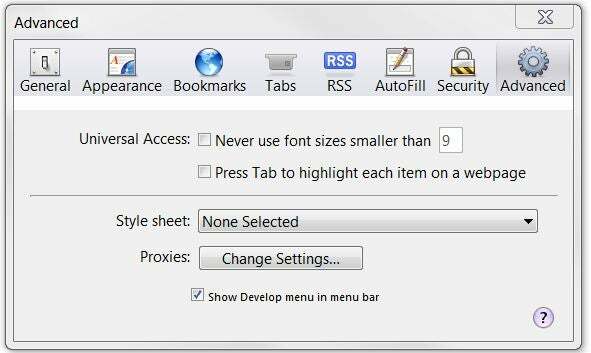 Enable the Develop menu in Safari. If you don't have a smartphone handy, you can still play around with some Google Buzz features by spoofing your user agent--basically, telling Google's Web server that you're actually an iPod Touch or an iPhone, so it will show you the Web app instead of the Google Buzz splash page that PC browsers get. The Google Buzz Web app, XXL-sized. First, download Safari if you don't already have it, open it up, and click on the gear icon in the upper-right corner. Click the Advanced tab and check the box at the bottom that says Show Develop menu in menu bar. Close the dialog box, click the gear icon again, and check Show Menu Bar; then choose the Develop menu, User Agent, Mobile Safari 3.1.2 iPod Touch (or iPhone). Now, all Web sites will treat you as an iPhone--including Google Buzz. From here, just open up the Google Buzz homepage, and you'll get a king-sized version of the mobile Web app. One caveat: Since your PC doesn't have the GPS information that Google Buzz is looking for, you won't be able to specify your location, and the Google Maps buzz layer probably won't work for you. However, you can still comment on all visible Buzzes and post your own. You need to set up a Public Google Profile to use Buzz. You have another way to start using Google Buzz's PC browser-based features without using their smartphone apps, but note that it means you can only edit your Following list, view Buzzes, and comment or "Like" other Buzzes. 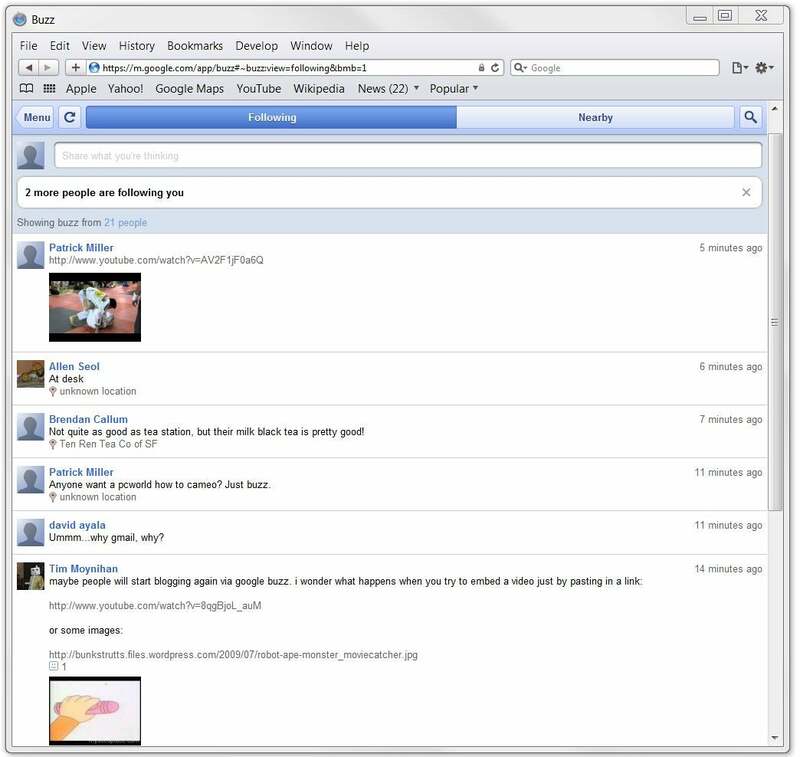 Since Google Buzz is tied into Google's existing Profiles app (which is, in turn, tied into Google Reader, Picasa, and a whole host of other Google Apps), you can actually access limited Google Buzz functionality through a Google Profile. You need to start with the URL of a public Buzz--my test Buzz, for instance--and click "Like" or "Comment". If you are already signed into your Google account, it will ask you to go through the normal Google Profile creation process. If you have one and it isn't Public (indexed in Google's search results), it will give you the option of changing it to a Public profile to continue. You need a profile with a first name, last name, and picture to participate in Buzz. Once you successfully add your Google Profile to Buzz, you'll be able to view and edit the list of people you're following, and view the list of people following you. Google Buzz sticks to a Twitter-like following mode, meaning that people can follow you without your approval. 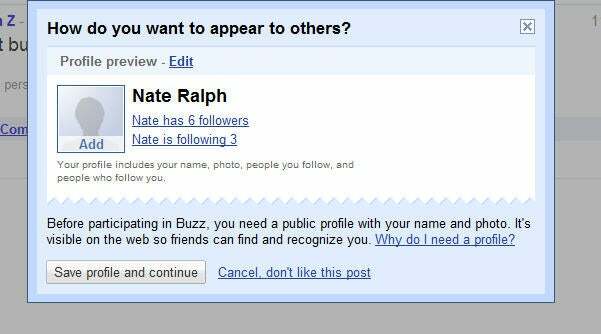 If you want to block users, you'll have to do it from their Google Profile page, not from the Buzz Followers list. Share your Google Buzz tricks (and opinions) in the comments!